This cottage was one of several cottages built on Michigan Avenue in the 1950’s. This home, with its hipped roof, is similar to the house built across the street at 2739 Michigan in 1947, but with elements more typical of the 1950’s ranch style, including the wrought iron columns on each side of the front door and the jalousie windows. It was built in 1955 for Oscar B. Wharf, a widowed carpenter originally from Ohio. Like all parcels in Dean Park on the southerly side of Michigan Avenue, this parcel was purchased by The Carl F. Roberts Company in 1913, who purchased 46 lots in Evans Addition for a total price of $6,000. In 1924, nine of these lots, including this property, was purchased by John M. Dean, the developer of Dean Park, with a $9,000 purchase money mortgage from The Carl F. Roberts Company. 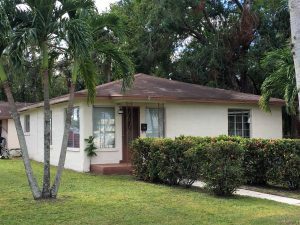 Mr. Dean re-sold these parcels in 1924 to The Fort Myers Realty Company, subject to the Roberts mortgage. Born in 1884, Mr. Wharf was the oldest of five children in an Ohio farming family. The youngest daughter, Goldie B. Wharf married Florida native Charles J. Jones in Ohio in 1924, and moved to Punta Gorda soon afterwards. By 1941, another brother, Harry, had moved to Punta Gorda. In 1955, Mr. Wharf, widowed since 1945, also moved to Florida after working throughout his life as a carpenter. By 1958, Mr. Wharf was ready to join the rest of his family in Punta Gorda. In July of that year, he advertised his home on Michigan Avenue for sale in the News-Press, and on December 3, 1958, sold it for $11,000. He moved to Punta Gorda, where he was in charge of “card and games sessions” for the Charlotte County Civic Association. He lived in Punta Gorda until his death there in 1979 at age 94. Contribute to the Dean Park Historic District fund today. Help us preserve history.